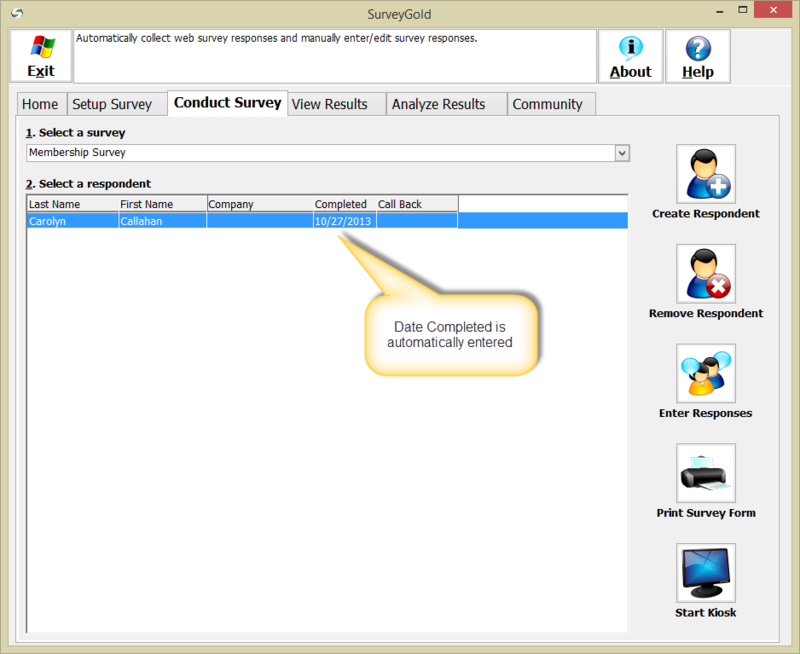 This section explains how easy it is to conduct a paper-based or in-person survey with SurveyGold. It explains how to enter responses and comments from a known respondent or from an anonymous respondent via a completed survey questionnaire or an in-person interview. You can add a new respondent at the very time you are entering responses from their completed paper questionnaire or via in-person interview. 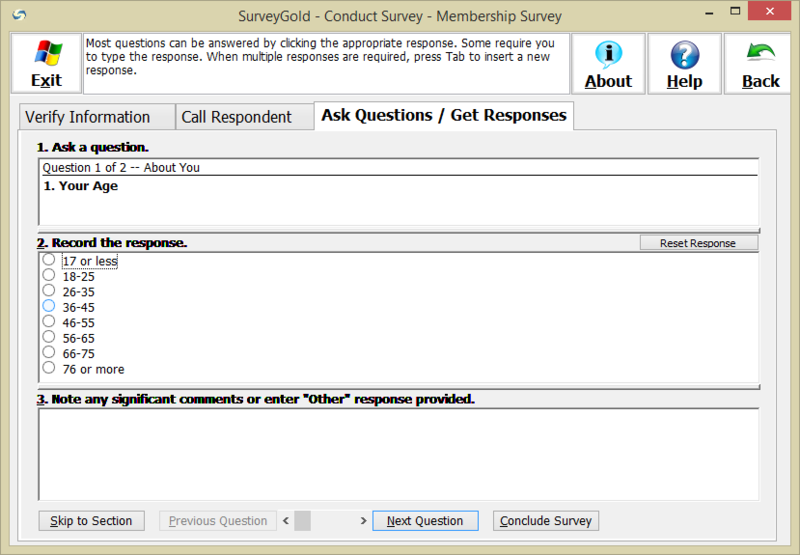 Step 1 - From the Conduct Survey tab folder, select your survey. 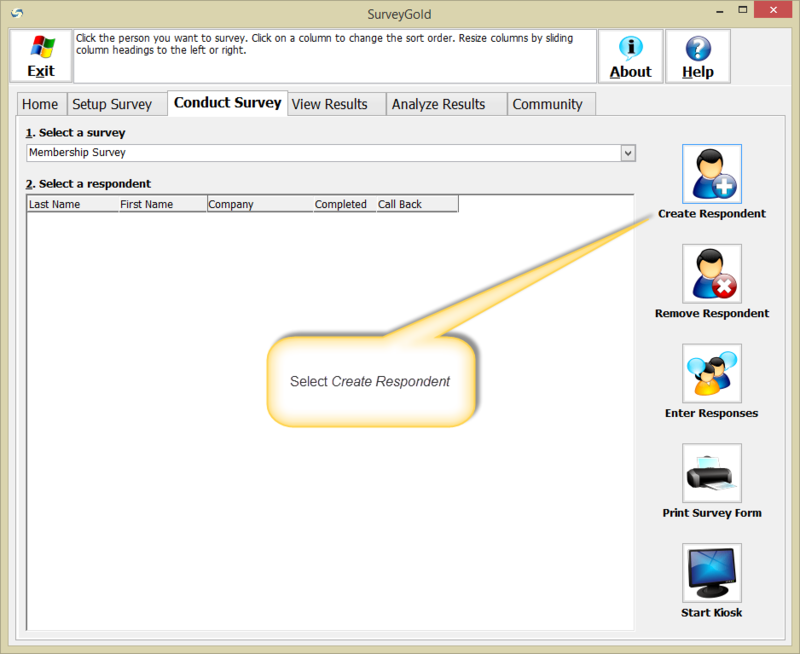 Then select Create Respondent. This creates a new respondent record in the SurveyGold application. It assigns the respondent's first name an arbitrary number and the respondent's last name is "Anonymous". 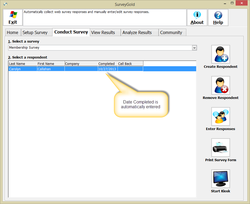 The newly created respondent is automatically associated with the currently selected survey. 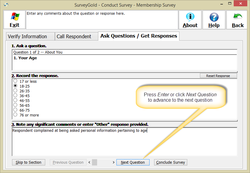 Note: This anonymous/number feature is designed to help you enter responses submitted on a printed questionnaire or when entering responses from an in-person interview. 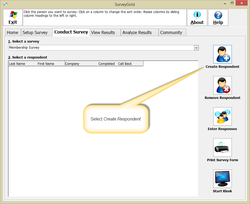 If your questionnaire has a field for the respondent's name, you can change the newly created respondent name from "Anonymous" to the respondent's actual name as provided by the respondent as described in the topic Entering Respondent Information. If you prompted the respondent for their name and contact information, you will want to replace the "Anonymous" name with their real name. You will also want to enter any other contact information they provided. This takes only a moment and is invaluable in terms of follow-up potential. Step 1 - Select the Verify Information tab. Enter any respondent information in the appropriate section. 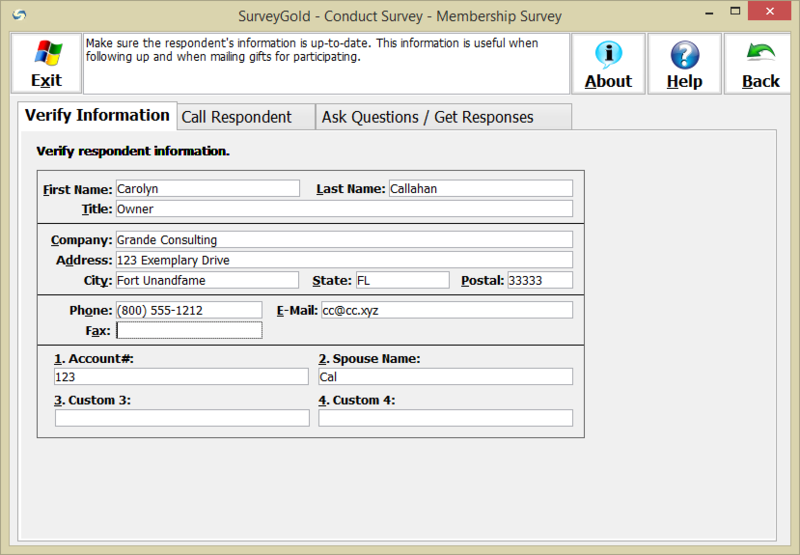 In this example, we are conducting an interview with a respondent named Carolyn Callahan. Productivity Note: Most questions can be answered by selecing the appropriate response. Some require you to type the response. When multiple responses are allowed and no choices exist, press TAB on your keyboard to insert a new response. 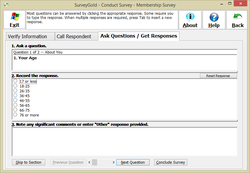 Productivity Note: SurveyGold was designed to minimize the time needed to enter a response. If you are right-handed, it may prove helpful for you to place your right hand on the mouse and your left hand on the Enter key on your keyboard (and vice versa if you are left-handed.) 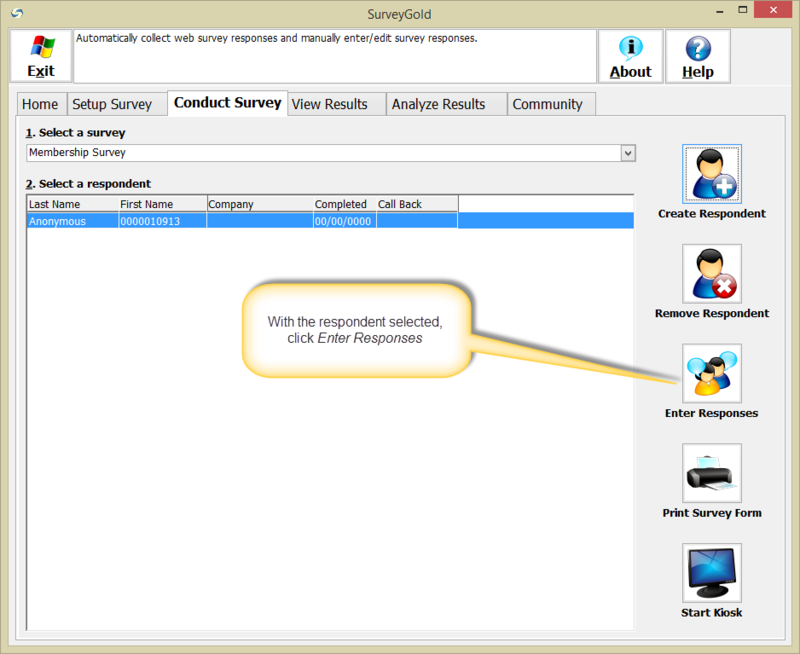 With your hands in this configuration, it is quick and easy to select a response and press Enter.